It’s been an interesting week or so for Digital Terrestrial Television in the UK – or Freeview as it’s better known. SDN has somehow been able to squeeze a little extra space out of the platform and put another channel up for auction, and it was won by Discovery. Before everyone gets too excited thinking “Woo-hoo – Discovery Channel’s coming to Freeview,” I should point out that it will be a new, so far un-named channel, that will be coming Freeview’s way. Expect to see repeats of programmes previously shown (and reshown) on their main brand services. It was illuminating to read that only one third of Discovery’s revenues actually come from advertising. Allowing for some sponsorship cash, some DVD sales etc., and some digital media revenue, that still means that upwards of half their revenues come from subscriptions. Perhaps somewhere in the 70p to £1.00 of your monthly Sky or Virgin Media subscription (I’m guessing). That’s not revenue that anyone will give up lightly. But the bigger Freeview news is the Ofcom announcement that HD is ready to roll on the platform. It looks quite exciting – there’ll be a BBC HD channel, an ITV one and a C4/S4C one (depending on whether or not you live in Wales). This essentially means that all those people with HD Ready TV sets who don’t currently subscribe to Sky HD or watch movies or play games on their Blu-Ray/PS3/Xbox 360 consoles, might actually have something to watch. [An aside – it’s somehow very funny to hear about people who have a Sky HD or Blu-Ray player and then hook it up to their TV with a SCART cable, and then perhaps extol the virtues of high definition!] Interestingly, the commercial broadcasters are looking at subcontracting space on their HD channels in off-peak hours. Channel 4/S4C will either offer an “on-demand” service overnight, or sub-let their capacity, while ITV will simulcast between 1800 and 2300, but may also offer “on-demand” services or sub-let its off-peak capacity. This whole endeavour will require new boxes for everyone who wants to receive the channels to allow for the MPEG-4 and DVB-T2 standards. And I’d guess that it’d be in most people’s interests to heavily promote PVR devices rather than simple £20 decoders. If ITV and C4 are going to sublet capacity then viewers will need to be able to record their services. So I’d look out for a “Freeview+ HD” badge on any box I’d buy. I’m interested in the idea of “On Demand” though. Sky has something called Sky Anytime TV which has never worked on my Sky+ box, but records and saves choice Sky programming for me to watch “On Demand”. I’d imagine that it’s this kind of thing that ITV and C4 are thinking about. I may not have realised that I wanted to watch Jamie Oliver last night, but C4 knows better and has recorded an overnight version of the show for me to watch at my leisure on an “un-used” part of the hard-disk on my PVR (it doesn’t record the peak-hours version because I’m more likely to be using my PVR to watch/record other channels). These on-demand services needn’t be HD either. Ofcom was happy in its invitation to apply, to consider multiple SD services to be offered in off-peak hours. I just hope that sub-letting capacity isn’t a backdoor into offering premium rate programming on a subscription or pay-per-view basis. The other interesting aspect of this is that the new technology that’ll need to be employed for HD is exactly that which Sky was wanting to put through with its “Picnic” proposal. To re-cap: it wanted to replace its three current free-to-air Freeview services (Sky Three, Sky News and Sky Sports News), with four premium channels (e.g. Sky One, Sky Sports and Sky Movies – yes I know that’s only three). Sky got in quite a bitter row with Ofcom over who was prevaricating and who was providing what information. With the technology that Sky wanted to implement likely to be built into all Freeview boxes post about 2010, perhaps they’ll renew their interest in the scheme? Of course their capacity is not enough to provide HD programming, but they could undoubtedly broaden their offering to Freeview households. While I appreciate the news and sports news channels, I get the feeling that Sky isn’t really trying with Freeview. Sky Three is an afterthought that is only very occasionally used well. It’s true that you can watch repeats of superior acquired programming like Deadwood on the channel, but with a 0.6% share in September compared to 1.0% for Sky One, you know it could do a lot better. Don’t forget – Sky One is not available to Virgin Media or Freeview customers after all! The one thing that still concerns me about this move to HD is what impact it’s going to have on channels that are already being broadcast in that space. To make it clear, Multiplex B – the spectrum being handed over for HD use – currently carries all the BBC radio services, BBC Four/Cbeebies (time sharing), BBC Parliament and the BBC interactive channels (two full service channels, plus the news on-demand channels). All this has to be packed into Multiplex 1 (currently used by BBC One, BBC Two, BBC Three/CBBC, BBC News, and by regional radio services in Scotland, Wales and N. Ireland), and Multiplex 2 (currently used by ITV1, C4, ITV2, ITV3, ITV4, C4+1, More4, E4, and a radio service). Anybody who watched the coverage of Arsenal on ITV4 the other night will realise that the bandwidth on this multiplex is not spread evenly, and some channels have very poor resolution – especially if you put them up on your brand new 37″ HD ready TV. Multiplex 1 is on 16QAM and will move to 64QAM which does allow more capacity – but I’m worried about the quality of the shifted channels, and those already on Multiplex 1, and especially, Multiplex 2. But I remain concerned that quality is going deteriorate following this shift. London is perhaps going to get these new Freeview services ahead of much of the country following an announcement from Ofcom consulting over whether a pilot scheme should be held here. 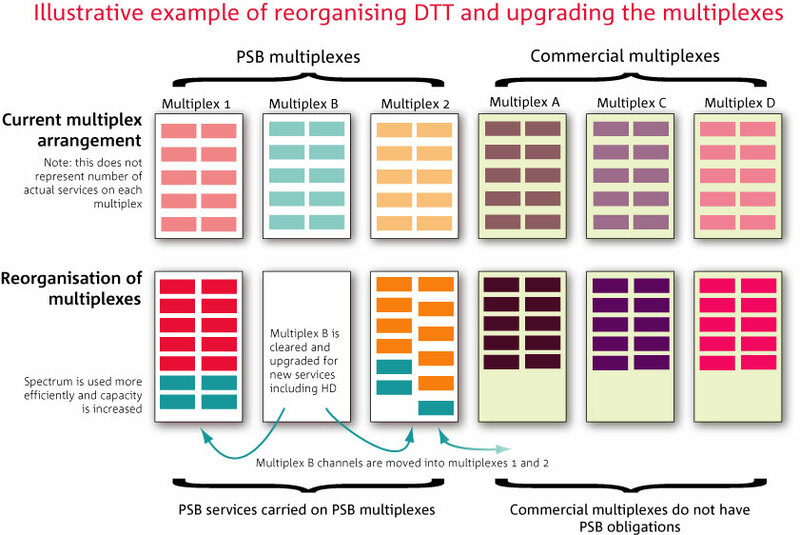 But this looks like utilising additional spectrum which means that even if it works fine, we won’t know how things will work out when we’re limited to the six DTT multiplexes currently in existance. Of course, post analogue switch-off, there’ll be plenty more spectrum around, but Ofcom looks to be trying to make as much cash from that as possible and not simply handing it over for more Freeview services – HD or otherwise.